The project of this month reflects the problem of biodiversity loss on farmland in Europe and demonstrates how hunters contribute to nature conservation in the Netherlands. Agricultural areas in The Netherlands are increasingly becoming more intensive, industrial and monotonous. This means that wildlife from extensive managed crops and grassland is going down in many areas. For wildlife like Pheasants, Grey Partridge and in future also Hare, this represents a serious threat. 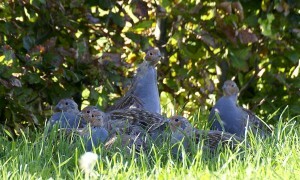 They depend on a diverse landscape in which they can find a diversity of cover and food. In Europe, there is an increasingly bigger call for diversification and extensive managed crops in agriculture. Not only focused on higher yields and greater efficiency, but with a vision towards enhanced biodiversity too. Cooperation with landowners and nature conservation (NGO’s) is important to succeed. Farmers and hunters in the Netherlands are putting more effort into creating habitats for Pheasants and Grey Partridge and diversity of butterflies, honeybees and other insects. 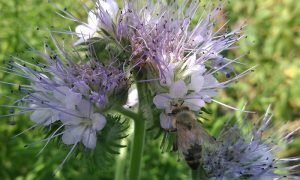 The Dutch hunting association (Koninklijke Nederlandse Jagersvereniging) came up with a sowing mixture that is easy to grow and provides protection and food for different animals. 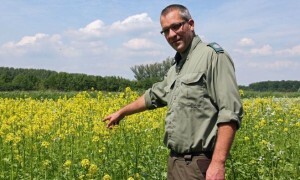 The sowing mixture contains 40% yellow mustard, 30% Buck wheat and 30% Phacelia. Yellow mustard creates cover for different kinds of animals, like Hare and Roe Deer. 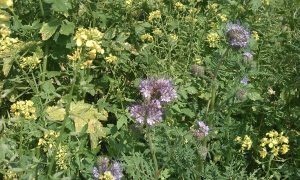 Mixed with buck wheat, yellow mustard can also provide food for birds and the phacelia attracts different useful insects, which are an important source of protein for young birds in spring/summer. In 2016, there was a little over a 1000 kg of the sowing mixture sold. This amounts to a strip of 1 meter broad being 220 kilometers long.